Future homeowners, Jarvis and Tiarra, putting the first nail in their home. Habitat for Humanity Williamson-Maury will receive a grant of $70,000 as part of a $1 million donation from Nissan North America to support local Habitats across the U.S.
For the last 11 years, Nissan has sponsored and volunteer-built a whole home each year for the HFHWM affiliate. This year’s HFHWM Nissan Build began on October 5th on Chester Road in Fairview, TN. Over the last six weeks, 300 volunteers from Nissan’s corporate office in Franklin donated their time to build a home with the Williams family. In December, the home will be sold to the family with an affordable, no interest mortgage, just in time for Christmas. 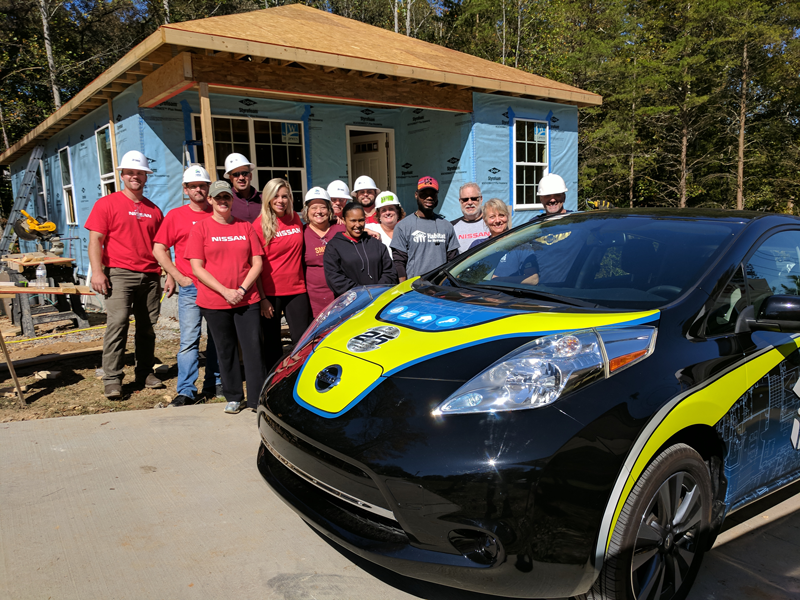 Nissan volunteers stand next to a 2016 Leaf that was donated to support HFHWM. Nissan employees will volunteer with Habitat in 13 communities working alongside families on home construction and revitalization projects. Nissan is also providing five Habitat organizations with Nissan TITAN trucks to be used to transport construction tools and materials. 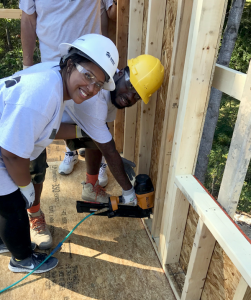 Nissan has contributed more than $15 million to Habitat nationally since the partnership began in 2005 when Nissan donated 50 trucks and mobilized employees to assist in home building following Hurricanes Katrina and Rita in the Gulf Coast region. Nissan has continued its support through the years by donating an additional 93 trucks and helping to build 85 homes across the U.S. Furthermore, Nissan’s employees have logged more than 97,000 volunteer hours with Habitat for Humanity. For 25 years, Habitat for Humanity Williamson-Maury (HFHWM) has partnered with local churches, businesses, foundations, and the public sector to provide 217 Williamson and Maury County families with the opportunity to purchase their own homes. Home construction and neighborhood development is funded through tax-deductible financial contributions and in-kind donations from local businesses, churches, civic organizations, and individuals, as well as through profits generated from the affiliate’s ReStore. These contributions, along with the labor of sponsor employees, church members, high school students, and other volunteers, enable HFHWM to build and sell homes to families who qualify. After a thorough qualification process, applicants are selected based on three criteria: the need for affordable housing, the ability to pay the mortgage, and the willingness to partner. HFHWM partner families must complete a homebuyer’s education program and earn at least 200 hours of “sweat equity” by working on their home and the homes of others. HFHWM sells the homes with an affordable mortgage to the families. For more information about our homeownership program, volunteering, or sponsorship opportunities, please visit www.hfhwm.org.